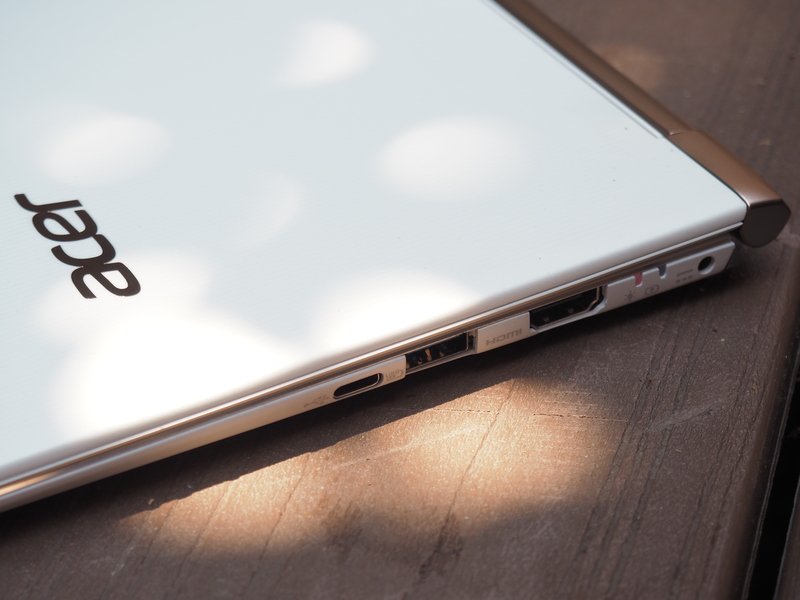 The first thing you notice about the Aspire S 13: It’s not a MacBook Air. In a space in which Apple’s laptop has so dominated the aesthetic conversation around thin and light laptops, it’s worth noting when a company goes boldly in some other aesthetic direction. 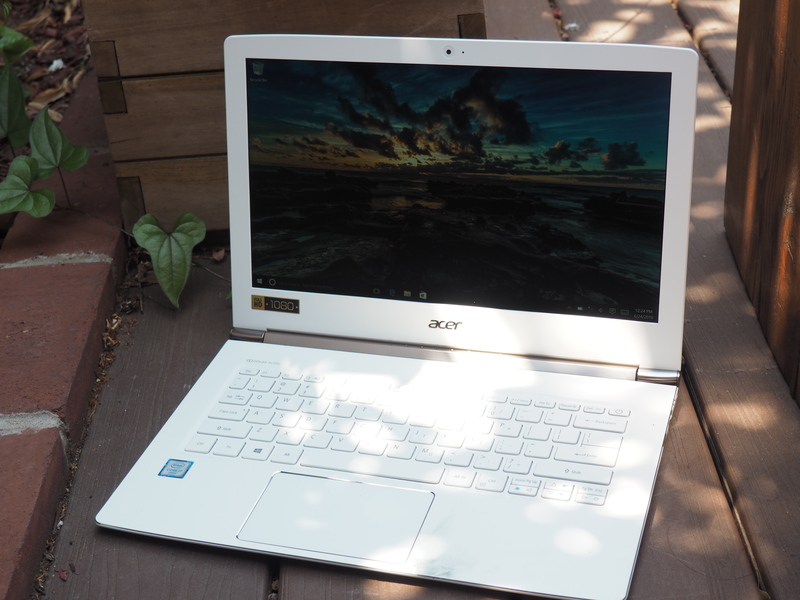 The primary way in which the new Aspire sets itself apart from the competition is in pricing, promising high-end specs and an ultraportable build starting at $749 (or the still nicely priced $999 premium model Acer sent our way). Couple that with some nice little add-on features like a matte touchscreen and you’ve got a compelling little travel notebook on your hands. The laptop ships in both black and white. 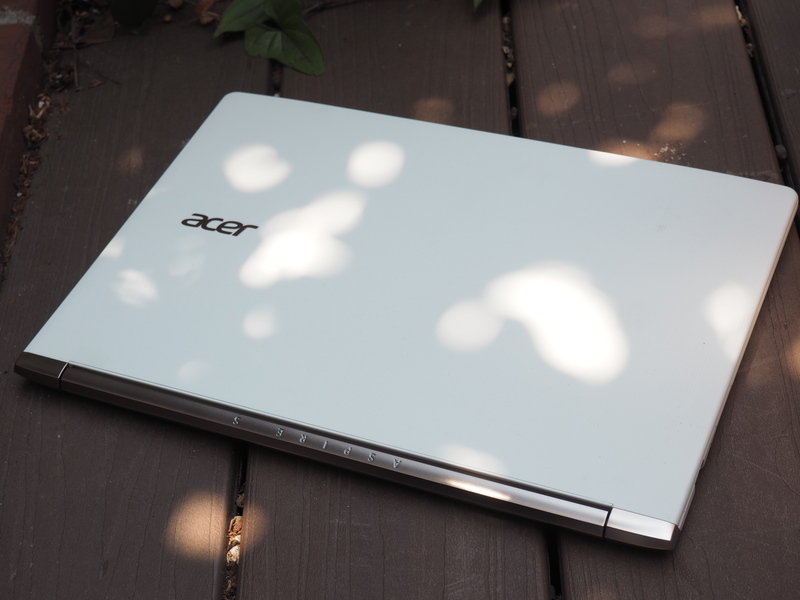 Acer sent along the latter, which is certainly the more eye-catching of the two options — though it will likely prove something of a dirt magnet, particularly if you handle it a lot (I’m already starting to pick up some gunk after a couple of days). The bottom is made of a metal alloy and the top is a textured shell with grooves for added traction. Acer’s added a nice, well-pronounced hinge with the words “Aspire S” prominently displayed, which lets the system open to nearly a 180-degree angle. For a brief, glorious moment, I thought I might be able to flip the keyboard all the way around and really take advantage of the Windows 10 touchscreen functionality, but alas, you’ll have to settle for a regular old one-in-one laptop here. The company’s done a nice job slimming the system down. The S 13 measures in at a skinny 0.59 inches (to the Air’s 0.68) and weighs in at 2.86 pounds, a tenth of a pound lighter than the Air (though our more premium model tips the scales at three pounds, even). You’ll find a USB 3.0 port on either side (one of which lets you charge gadgets when the system is off), along with one USB-C, HMDI, headphones and an SD card slot. Charging the system itself still happens through an AC adapter. 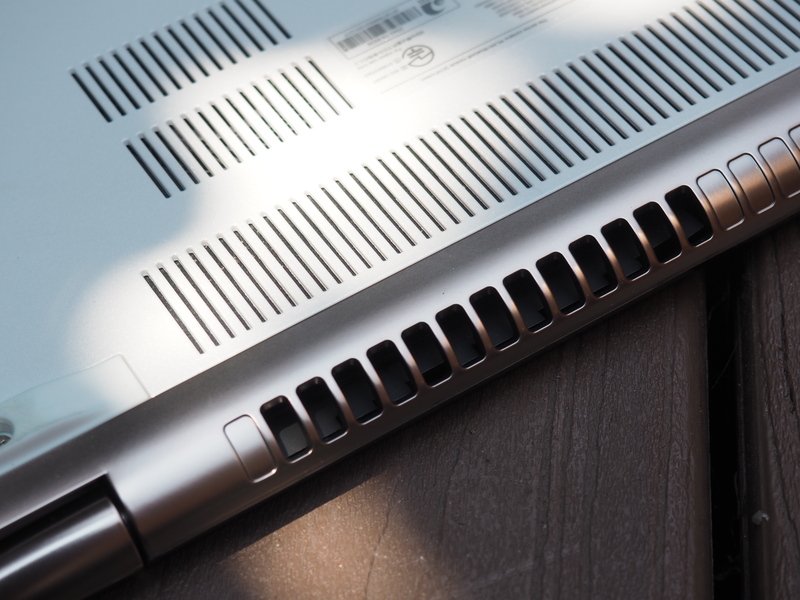 On the bottom, you’ll find some sizable exhaust vents and two small speaker grilles located toward the edges where it curves up slightly into a lip, leaving a gap between them and any flat surface on which you might rest the laptop. The full-size keyboard has a nice feel to it, offering a springier reaction than many of the mushy offerings on competing ultraportables. The trackpad, on the other hand, while mostly reliable, can be a bit fussy at times — all the more reason to consider investing in the touchscreen version. The bezel surrounding the display is on the large and plasticky side, both of which stand out on the bright white model. All in all, it’s a nice design, though the casing can feel a bit flimsy in the hand, particularly when compared to the all-metal shells of the competition. The Aspire isn’t fragile by any means, but the shell’s got a bit more give then most people likely want in their laptop. A matte touchscreen. Now there’s something you don’t see every day. Or matte displays on laptops, in general, these days. The glare you get on industry-standard glossy screens certainly isn’t missed here — particularly as I was using the laptop on a sunny day in the area out behind the back of my local coffee purveyors. The first time you navigate around the thing with a finger, you’ll notice a bit of difference — namely a bit of added friction versus a standard glossy display. It takes a little getting used to and might prove a bit cumbersome if you use touch as your primary driver, but I imagine that won’t apply to the majority of folks going all in on a laptop. The display is full HD — 1920 by 1080. It’s a sharp display with a nice color balance — one softened a bit by the matte design. The company’s also added a few display-related features into its Quick Access app, including Color Intelligence, which claims to optimize images (though it only does so when the computer is in use) and Blue Shield, which works to reduce eyestrain by limiting blue light. That one takes a bit of getting used to — the computer’s white balance just looks off at first. The Dolby-powered speakers are a big improvement over many of the sound systems offered up on comparable machines — which is to say they weren’t entirely an afterthought. It’s not the best sound I’ve heard on a laptop, by any stretch, but listening to music or watching a movie without offloading audio to a third-party speaker isn’t a bad experience. The system gets plenty loud and the on-board Dolby app lets you fiddle with levels to your heart’s content. The only real downside of the speakers are their placement. It’s fine when the system is placed on a desk or other flat surface, but they can get muffled pretty quickly on top of something more uneven like a bedspread or your lap. 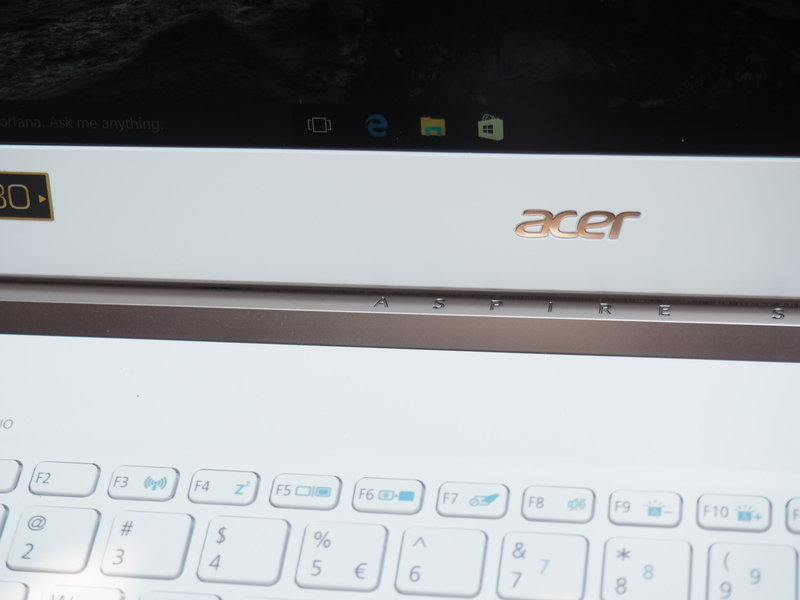 As mentioned above, Acer sent the higher-end configuration (the S5-371T-76UX for those into such formalities). The RAM is the same on both models, at 8GB, while storage has been doubled to a healthy 512GB. The processor has also been bumped up from a 2.3GHz Core i5 to a 2.5GHz Core i7, and the processing is suitable zippy. Acer has also bumped up the battery life from 4030 to 4810 mAh, effectively adding a couple of hours to its already healthy stated 11 — though that will take a bit of a hit with the touchscreen turned on. The Aspire S 13 isn’t a bad little machine, though it’s not going to set the world on fire, by any stretch. The build quality leaves a little to be desired, but some nice features, like a touchscreen and solid Dolby audio, help round out the picture. And, of course, that $749 starting price goes a long way toward making this a compelling purchase for users looking for a solidly performing Windows 10 thin and light.